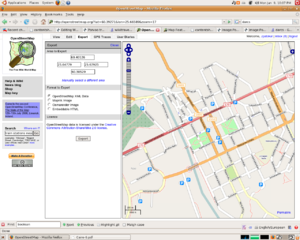 The archived material from this page is at Wikitravel:How to create a map/Expert maps. For current guidance and discussion on mapmaking, see Wikitravel talk:How to draw a map. 3 What if i dont use Ubuntu? What if i dont use Ubuntu? I'm trying to create a map for the first time and am running into problems. I've downloaded all the software. I've edited Config.mk, changing the destination to Kilkenny, my home town. I've downloaded the data.osm. When I run make, it works, but I get a map of Paris. xmlstarlet sel -N mw=http://www.mediawiki.org/xml/export-0.3/ -t -v "/mw:mediawiki/mw:page/mw:revision/mw:text"
wget -q -O rels.xml "http://openstreetmap.org/api/0.5/relations/search?type=name&value=1er+Arrondissement"
wget -q -O relation.xml "http://openstreetmap.org/api/0.5/relation/`cat relid`/full"
I'll try to help you with this. The first thing you need to do to get this to work is to create a border "relation" around Kilkenny in OSM. You can do this by adding ways to a relation, and then naming it a border. It's probably also a good idea to give the relation an "Is_In" tag, which will help identify it. The next step is to edit Config.mk so that the wget commands in the make process find the Relation you've just made. # ORIENTATION can be either "landscape" or "portrait"
# SIZE can be "one-page" or "two-page"
# If using auto listings placement should expand the map to fit them? Once you are satisfied that everything is in place, click the [Export] tab and move the view so you can see the desired map area. Note that you will not see the changes you just made, but don't worry: they have been saved, it just takes a view (up to a day) until the OSM website gets around to rendering them. Select "Format to export" as "OpenStreetMap XML Data" and download the resulting file. Name it data.osm and move it to your working directory. The exporting can take several minutes if you're downloading a large chunk of a big city, so be patient. If your browser times out, try downloading the URL (http://api.openstreetmap.org/api/0.5/map?bbox=...) with the command line tool wget. This page was last edited on 21 May 2012, at 03:38.